One husband-and-wife studio is embracing the new age of livestreamed video games. Livestreaming sites like Twitch and YouTube Gaming are driving developers to rethink the way their games are played (and watched). One studio in particular has embraced this spectator-focused industry, and it's pushing the boundaries between player and audience member: Robot Loves Kitty is the husband-and-wife studio responsible for Legend of Dungeon. Its latest spinoff, Legend of Dungeon: Masters, allows Twitch viewers to drop helpful items or dangerous foes into the games played by their favorite streamers, live. It's almost like playing God, but in a dark, hellish dungeon -- perhaps "playing Lucifer" is a more correct phrase. 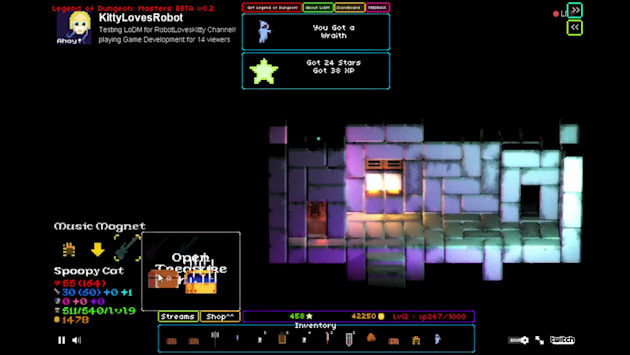 Players boot up Masters and choose to watch a Twitch stream of Legend of Dungeon, Robot Loves Kitty's gorgeous multiplayer rougelike that hit Steam in 2013. 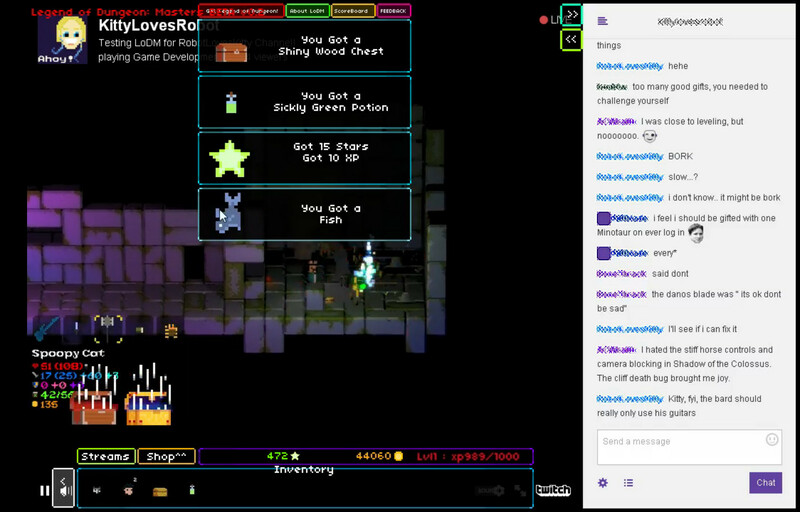 Whenever the streamer opens a treasure chest in-game, viewers watching via the Masters client get the goodies inside. The audience then decides whether to give the items to the streamer -- things like protective clothing, new weapons or terrifying demons -- or hold on to them for use on another streamer. Viewers can also attach short messages to their "gifts," vote on random, in-game events, and send in friends or foes during the streamer's journey. They don't need to drop commands in the actual Twitch chat, meaning Masters viewers can freely plot strategies there along the way. Designer Alix Stolzer (the Kitty half of the studio) says that livestreaming has had a huge impact on the way she makes games. "We've been pretty heavily influenced," she says. "Not just with adding interaction, but from seeing how people experience a game live. From a development standpoint, there is a lot you can learn from watching people play your game in front of an audience. Much like YouTube Let's Plays, it's become another way to gain visibility, so having a game that is appealing to streamers is something we know will benefit us. I've heard a lot of dev friends talk about it as well." Masters is almost a trial run for a much larger game Robot Loves Kitty is working on called Upsilon Circuit. That project is a new kind of live "game show" made with Twitch in mind, featuring layers of audience interaction and truly permanent permadeath: When a player (not a viewer) in Upsilon Circuit dies, they can never, ever play again. Every moment of the game is streamed live online at specific times and audience members have nearly omniscient power, filling out players' skill trees and potentially harming or helping them. Masters uses the interface created specifically for Upsilon Circuit. Robot Loves Kitty's work toes the line between video games and social experiments, but Stolzer says she and husband Calvin Goble aren't trying to mess with anyone's minds. Not too much, at least. "It's experimental gameplay with heavy social elements," she says. "Social gameplay is a new concept, so in a way we don't really look at it like a social experiment. There are some things I am looking forward to within Upsilon Circuit that are definitely social experiments." Not every studio is able to crank out an experimental game like Masters -- after all, it requires a fairly large existing player base. Robot Loves Kitty has sold more than 200,000 copies of Legend of Dungeon, which puts the studio in a good position to try this Twitch-based project. As for development costs, Stolzer and Goble have a history of living lean: Before Legend of Dungeon launched in 2013, they lived in a tree in Vermont, partially to save on expenses. Stolzer isn't sure if live-audience interaction is the future of gaming, but she's certainly having fun with Robot Loves Kitty's projects for now. "Everything so far is just scratching the surface," she says. "We are hopeful that it will at least become a notable genre."